This post was sponsored by Balsam Hill. You can see my disclosure policy here. A new Christmas tree has been on my wish list for a long time now. Preferably a white Christmas tree. I always think the scale of a tree is so important if you want to make an impact. My motto is “go big or go home.” But while our last tree nailed the grand scale I wanted, it just didn’t look… real. The more I had to photograph the tree for my blog, the less I liked it. From a distance with my eyes squinted it looked great! But a close-up photograph does not lie. The tips looked fake, and I couldn’t get the fullness and fluffiness I wanted from the branches, either – it looked kind of sparse, no matter how I dressed it. These are definitely first world problems. Which is why I put up with my old tree for many, many years. It was purchased in a post-Christmas sale for a pittance, and it served us nicely for well over a decade. But as a die-hard Christmas loving gal, my secret dream of a full, fluffy, realistic-looking, dreamy white Christmas tree would not die. Which is why when I came across the company Balsam Hill, I felt a little spark and an undeniable flutter. Is it too weird to use romantic analogies for an artificial tree? Because if there was a Tinder for Christmas trees, I would’ve swiped right for these ones. The photos I kept seeing all looked amazing. They were so full! They were so fluffy! They had so many tips and the tips looked so…. so real! What was this magic and how did they do it? I didn’t know, but I wanted one. And now that it’s here, I’ve fallen hard. My new white Christmas tree from Balsam Hill is everything I ever dreamed of. We’ve moved past the Tinder stage and now we’re in a committed long-term relationship and very happy together. And I’m in the nauseating honeymoon stage of telling everyone exactly how in love I am. I know you must have all the details, so here they are! I chose the Mount Washington White Christmas tree. It’s 210cm tall and pre-lit with clear LED lights. The fairy lights are quite magical – they are scattered perfectly throughout the tree, all the way through the fullness of the branches and not just on the outside. I feel like my life has changed significantly for the better now that I no longer have to begin the month of December by untangling a rat’s nest of fairy lights from the garage and trying to wrangle them around the tree. I was never very good at this part. In fact, some years our tree remained unlit altogether because it all seemed like too much effort. These built-in lights give the tree a beautiful luminescent glow. The tree came in three sections, and it has an “Easy Plug” system so that as you slide the poles into place, the lights in the next section click on automatically. I did not know this would happen and it was a nice surprise that made me very happy. Obviously invented by magical elves. The tree looks even better and more realistic than the photos gave credit for. Look at the fine detailing on these tips. There are actually three different types of tips on the Mount Washington tree, and together they create the perfect combination of full + fluffy + realistic. It is so full that you wouldn’t even need to decorate it, really. It would actually look beautiful naked, with just those twinkling lights. Sorry, sorry, TMI, I shouldn’t have said it would look good naked. I told you we’re still in the honeymoon phase. I’ll try to be more discreet. 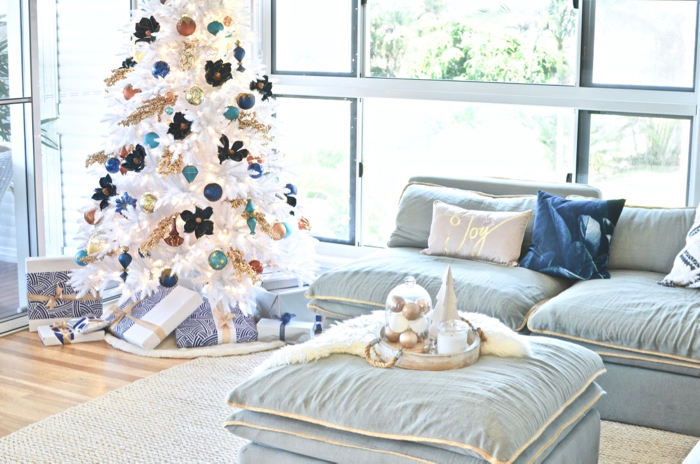 As I mentioned, I’ve loved white Christmas trees for a very long time. There is just something so pure and fresh and magical about them. And from a decorating point of view, they are a dream! – the clean high contrast of white means it’s so easy to make a statement with any colour scheme you choose. Balsam Hill supplied me with the most beautiful ornaments to decorate this tree with. I fell in love with the Georgetown ornament set. They are hand-painted glass ornaments and they are simply exquisite. 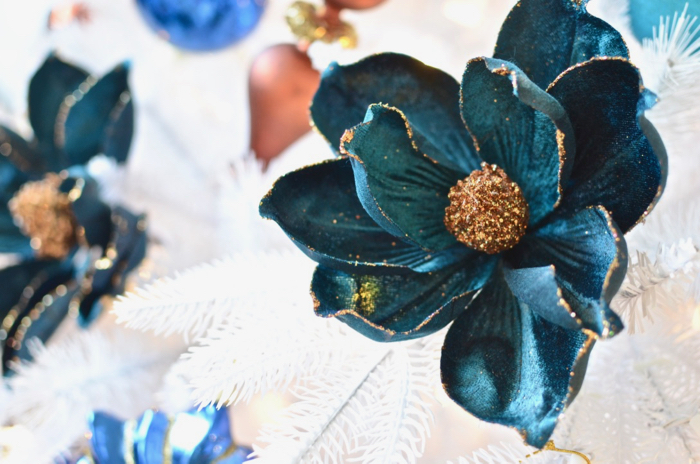 The shades of indigo, copper and turquoise look absolutely stunning against my white Christmas tree. Each piece is unique and there is such a variety – from gem-encrusted baubles to jewel-like prisms and elegant finials. I used two sets of ornaments to cover the tree. I also selected these stunning indigo magnolia picks, which came in a set of 12. The petals are lush and velvety with gilded edges, and they come in a loose bud that you unfurl and shape. I just love them! The gold berries are another set of picks which you can find here. 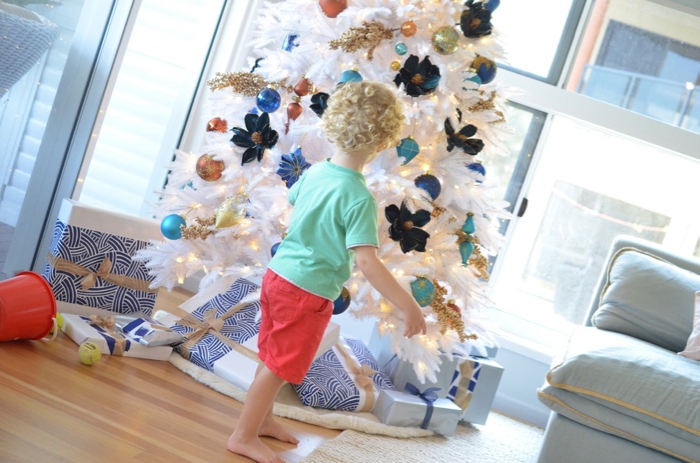 I love the texture and movement they add to my white Christmas tree. Balsam Hill also supplied this luxurious faux fur tree skirt. I feel like a real adult now that my tree has a skirt. No more sitting on the floor for my gifts, no way. We are fancy around here. Our gifts sit upon the softest fur. They may be poked and prodded by the grimy fingers of multiple curious children, but they shall not touch the ground, no sirree. Oh, he was EXTREMELY helpful. In case you’re wondering, yes, two years old is a FABULOUS age for “helping” Mummy decorate a tree with very expensive glass ornaments. I highly recommend it. It is not stressful AT ALL. Please note the red bucket full of balls in the next photo, which Charlie was flinging randomly around the room at this point while I desperately tried to intercept any missiles heading in the direction of My Precious One And Only. Okay, he’s precious too. Although my appreciation for his preciousness was somewhat lacking at this point, at least until I bribed him with a movie and a bowl of snacks to STAY AWAY FROM THE TREE. There is a reason that I set this tree up at my parent’s place and not my own. They only live 5 minutes down the road, and My Precious white Christmas tree has more chance of surviving intact until Christmas Day without the daily presence of a toddler bent on mayhem and destruction. As a bonus, this means we will set up our old tree at our house this year, and the kids will have free agency to decorate it however they please with every last ornament they’ve ever constructed from paddle pop sticks, toilet rolls and pom poms. I won’t even go around behind them rearranging their ornaments, and that is legitimately a first. Win/win. Let’s take a look at the other side of the room. Balsam Hill also provided me with this very pretty LED birch tree. This is the 120cm size, which is a nice height for a console. You can also use these outdoors! They come in sizes up to 180cm. Have I shown you enough pictures yet? It really is like a honeymoon album. Can’t. Stop. Taking. Photos. On a deeper note, I was thinking today about the sweet, almost old-fashioned notion of Christmas spirit. As the shopping centres get more crowded, parking spaces vanish, and the rush and overwhelm sets in, it’s easy to become tense and impatient with strangers. Today, in a very busy car-parking situation, a stranger held back and waved me in front of him. I remember thinking how such a simple act felt like such a welcome kindness. And how that really sums up the Christmas spirit. It’s a happy time of year and we have so much to celebrate in the birth of our Saviour. He is our Joy come down to earth. Let’s gift small acts of kindness to each other this season. A cheerful smile to a harried stranger in the shops. Holding back instead of pushing and jockeying for our position. Small acts that shine our light and spread joy. I hope this tour felt as magical for you as it has been for me to put it together! 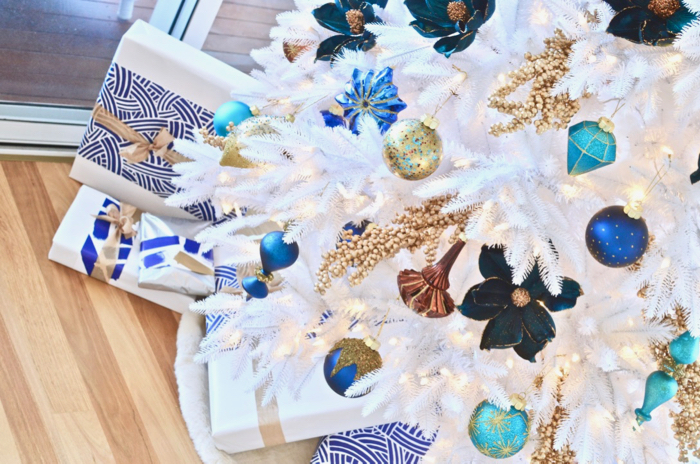 Many thanks again to Balsam Hill for supplying our gorgeous white Christmas tree and the other beautiful products for this post. Let me know in the comments, do you prefer a white or green tree? Do you have a favourite product from this tour? And how do you plan to spread some Christmas spirit to those around you this season? It’s soooo pretty and I love how it helps lighten up the room! Beautiful tree! 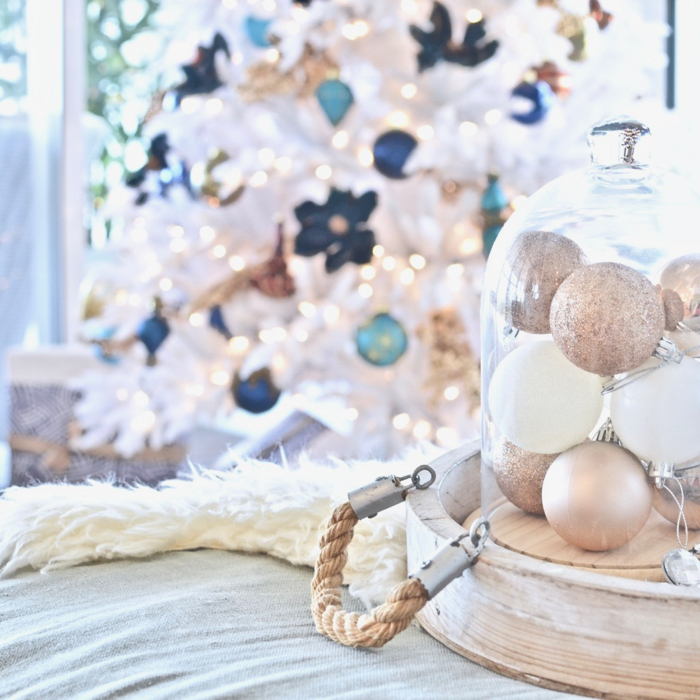 And those glass ornaments are drool-worthy! 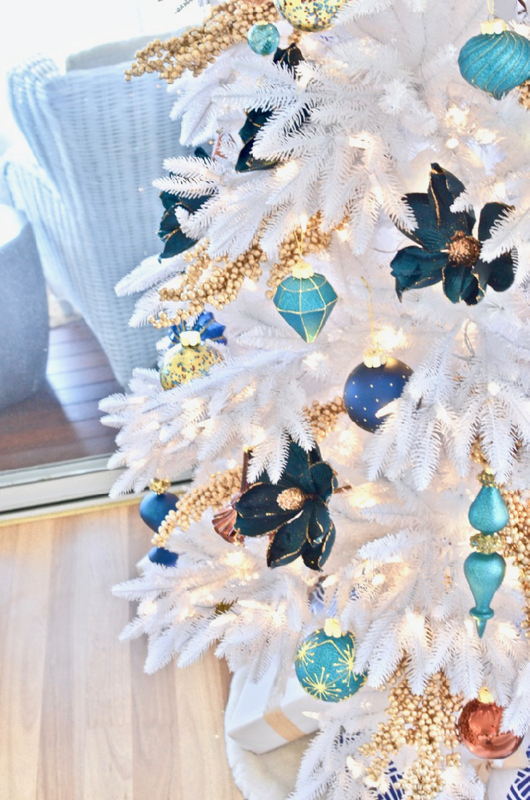 I love how the colors really “pop” off your white tree. Funny about the bribing to stay away from the tree, lol! Two years ago, my son (2 yr old at the time) would take off the glass bulbs, remove the hangers and throw them on the floor, watching them explode as if they were grenades. Ugh! Last year I almost didn’t put up a Christmas tree. The last week before Christmas, I put up our artificial pre-lit tree – with no ornaments at all – added a red bow to the top and that was it. It gave enough sparkle to give a cheery vibe for the holiday. This tree is gorgeous!! I am loving the bold colors against the crisp white! 😍 And that little helper sure is adorable too! Oh my goodness this is beautiful. It does look peaceful. Have an amazing Christmas and I hope Santa puts something special for you under this beautiful tree. O M G!!! I ❤️ this tree! I have always loved green trees but this beauty has changed my mind! 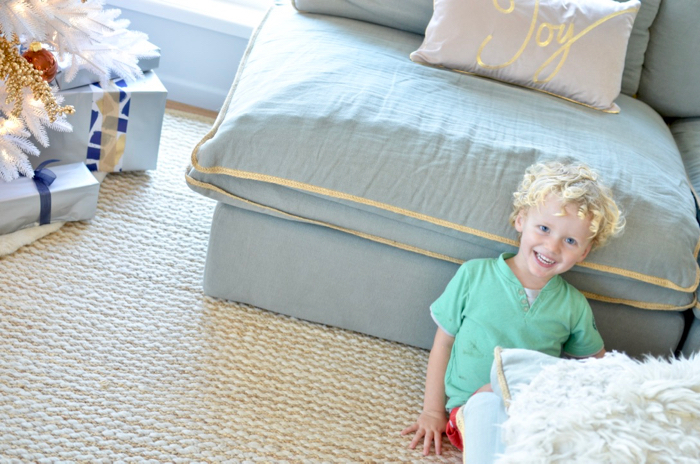 So fluffy and snowy white… so many possibilities!! I.Must.order.one.now!!! Girl, you had me at the white tree. I have ALWAYS loved white trees. The way they make colors stand out. It’s a very beautiful tree. Currently I can’t decorate my own as our son and his family is currently living with us and we only have room for one tree. And since they have 3 kids we let them do the tree and decorate it. And Balsam Hill has beautiful trees as well. Christmas has always been a special time for my side of the family. And since both my parents have passed I try to continue to pass along the same traditions. You have adulting down pat! Christmas goals right here. This is such a beautiful tree! I personally always love the white trees on display in various stores, especially with the pink or gold or silver ornaments. I think when I have a house of my own I want one like this, so hopefully they will be in stock for a while! Stunning – what a beautiful color combination. Haha, the tinder references were funny and made me smile! 🙂 So you have spread some more Christmas cheer now. I didn’t even realise Balsam Hill were in Australia! Their trees look gorgeous – and gees, you have me majorly wishing that I could be a real grown up and get one with lights attached! But I would get a green one – it would match my house colours better. Beautiful tree. Especially love the indigo magnolias in contrast to the white branches. Fabulous. Wow, what a stunner Karen! I think those magnolia picks are my favourite but everything is just exquisite and I can see why you are so love! Well done, beautiful tree, my friends in Washington state had their tree professionally flocked every christmas and it was stunning. I love the white christmas tree. Keep up the greatest works my dear, you are also stunning!!! Beautiful! I love the magnolias against the white. Don’t think I’ve ever seen such a dense, fluffy tree! It’s hard to believe how big your ‘baby’ is now. He seems like a bundle of sunhine all on his own! This is lovely and the decorations are quite different which in itself is nice. I’m a red fan so would have to get a bit of red on there. Great job Karen! I love it! I am very traditional… so it’s green for me. Especially because I live in an area where we don’t see snow…. I also love that it is not overdone with ornaments. Mine is full, but the tree isn’t as full as this one is so it kind of needs more or there is too much empty space. The blues are magical!! Beautiful!! Karen I too love those magnolias, just stunning! I love your tree! I am just slowly warming up to white trees! Just recently I was shopping, and saw one I was attracted to. Yours is magnificent! I will be putting up a green tree, after having real trees for the past few years. I have seen Balsam Hill trees before and have gravitated toward them. Someday I hope to be able to afford one. I love their love and detail they put into each tree. The look so real! I love Christmas trees. I have a rose gold one, a green one, a blue and orange one (bronco tree), and a white one. But I do have to say I am partial to white. Although am looking for a red one for next year. I love the colors on your tree. My favorite part was about your two year old helping. “Not Stressful AT ALL!” As mother of four, that is a language I truly understand! Merry Christmas to you, Karen! I’ve always had a green Christmas tree but your new white tree is quite beautiful. I’m definitely going to consider a white tree in the future. Love it. Looks great. As much as I would like a white tree we already have a green tree with built in lights and about twenty boxes of various decorations that we store in the loft space. So, I think I’ll have to stick with my green tree. At lease for now. Oh G!! A Balsam Hill Christmas Tree has been something on my wish list for the longest time!! I love the pre-list natural looking trees 💕 Gorgeous! Beautiful, beautiful tree! Not completely sure, but I think the magnolia picks are my favorite and so lovely. 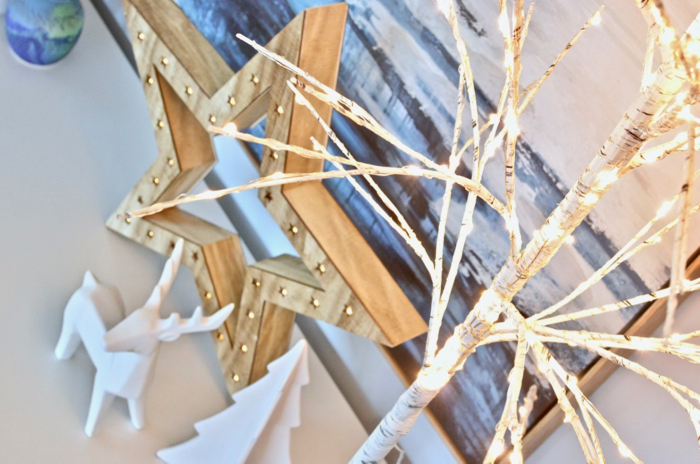 The birch tree complements your decor perfectly too! 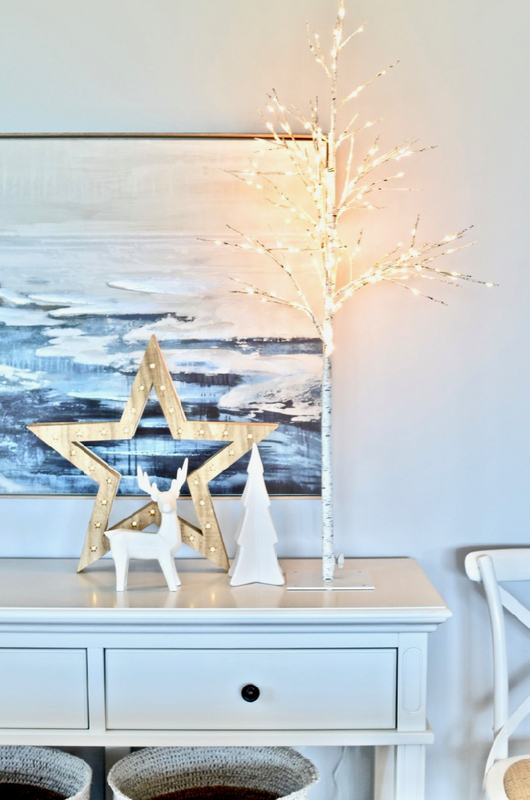 Beautiful decorating! Wow thats awesome and beautiful!!! 😍😍😍 We have a white Christmas tree, too, not the same brand though and if comparing, yours totally wins! But I love my tree anyways and now I got some inspiration to change/ make new ornaments because I really fell in love with those Magnolia ones!!! 😍 I read your post about the situation of your blog by the way and I need to apologize!!! You have given me tons of inspiration and it really just didn’t hit me to share it and for that am so sorry! 😢 I don’t use social media but Pinterest and now am gonna share this post and my other favorites from your blog in there for sure! I hope you keep on inspiring us and I wish you and your family all the best and an amazing Christmas time! It’s beautiful! I love the contrast of the shades of blue against the white tree. Wishing you a joyful season and much Christmas spirit from Germany! I’m not fond of white Christmas trees, but yours turned out beautiful. Love the colors you used to go against the white. I would have liked a picture at night with the lights on. I do love the birch tree. Thank you so much for sharing with us all your projects. Love getting my emails. Merry Christmas and have a wonderful happy and healthy New Year. Oh this tree! 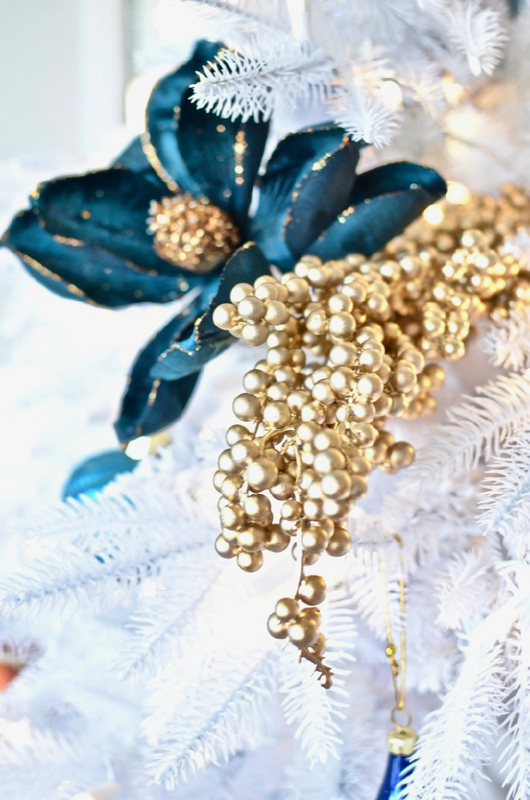 It is so beautful & the ornaments are gorgeous! I could totally see this tree in my living room! 😄 Even the color scheme matches my house… this might be love! 🥰 Thank you for sharing! Love to follow you! Love the tree! So beautiful! You decorated it just perfectly! Lovely tree and very inspiring photos, Karen! You’re great! Thank you! Merry Christmas! Very beautiful Karen, with restrained, beautifully coloured ornaments. A green tree is still my preferred option. We bought ours post Christmas from Coles (believe it or not) 7 years ago for $70. It has lovely long, fine needles and has such a beautiful shape. 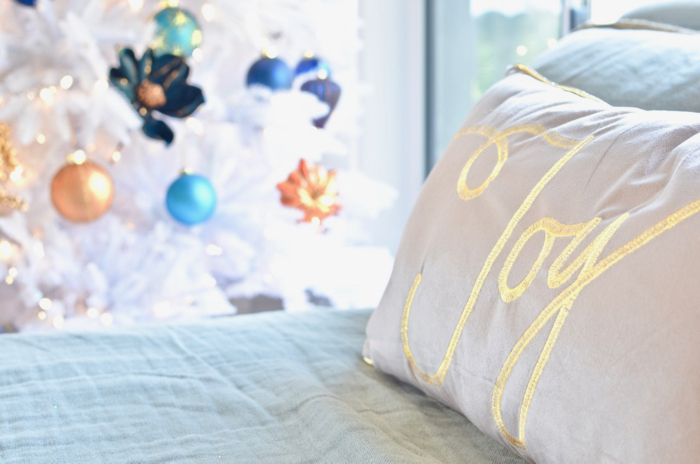 A couple of years ago, I bought a glittered paper banner from Pottery Barn that says “A very merry Christmas’ which now wraps itself amongst the boughs of the tree each year. I love it. Absolutely beautiful! I would be afraid to breath next to it as I can trip over my own two feet. Lol! The kind of tree dreams are made of. You had me sold with the lights! I always hate dealing with lights on a tree. Love the fluffiness of the tree. Great choice on the blue ornaments, love the blue tones. You’ve turned me! My grandma used to have the saddest, scrawniest, plastic-iest white Christmas tree and I’ve been unimpressed with white trees ever since. I was a little skeptical at the title of this blog post, but…… WOW! 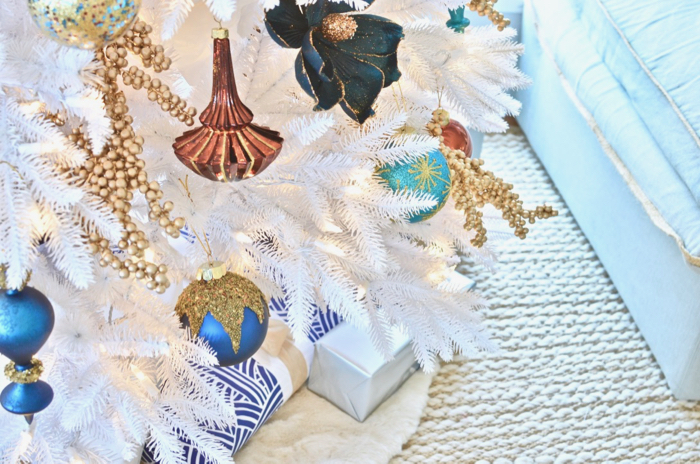 Your white tree is so full and fabulous and I LOVE the ornaments you paired with it. What a beautiful display! Now I need a picture of it at night! Just gorgeous! You did a beautiful job decorating the tree! It creates a very warm, wintry feeling. Love it! I love the navy color! 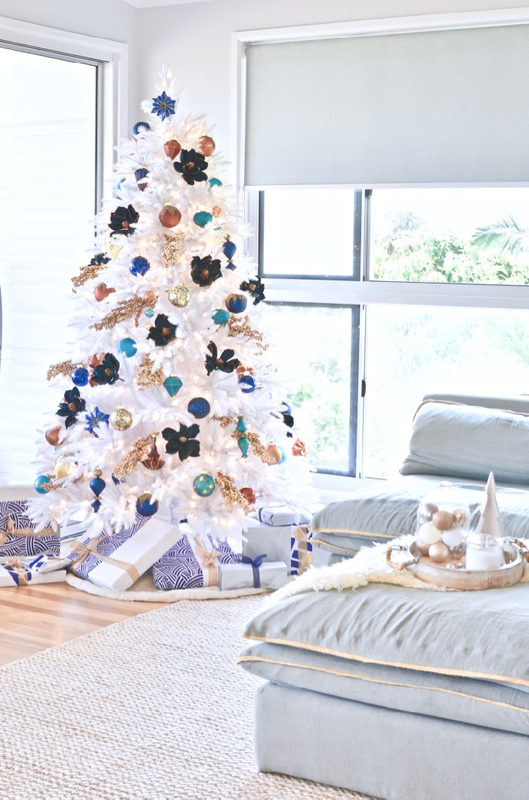 Your white tree looks ABSOLUTELY STUNNING! What a head turner! 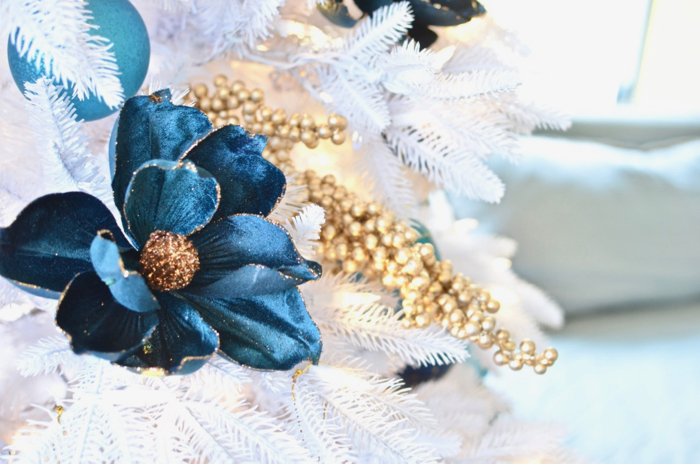 I especially love how it makes those gorgeous blue ornaments and baubles POP, when they’d hardly stand out on a green Christmas tree. Nice job, Karen! Never thought I’d join the white tree crowd (pretty regal) but this year–I finally hit 40–I think it is quite magical! An “acquired taste” maybe, but you make it look exquisite! BLUE! 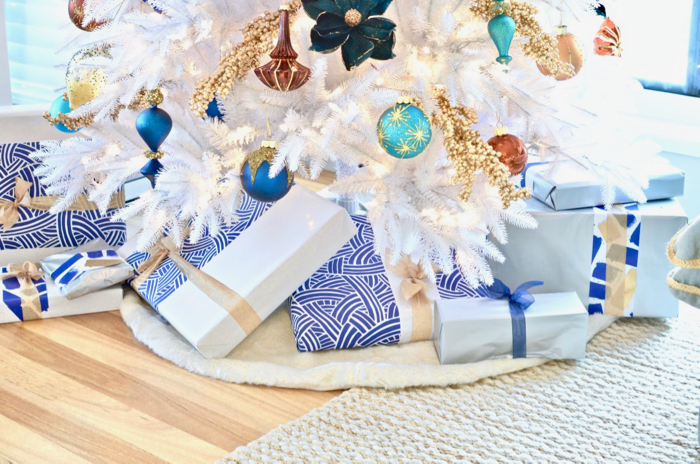 I love Christmas blue! Our yard is all blue lights (idea from a house that was decorated in all blue when growing up). 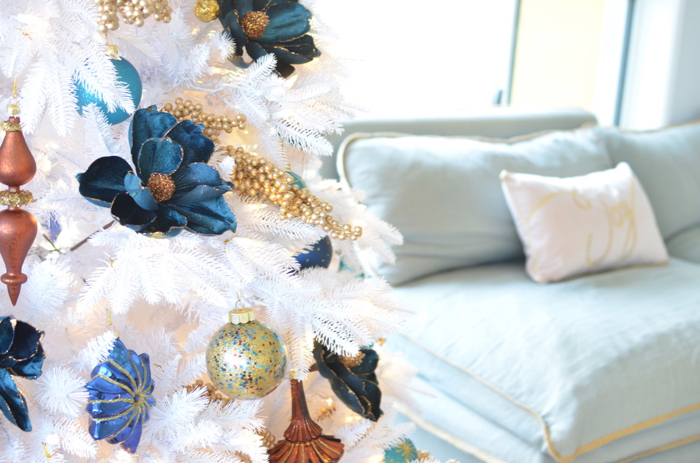 The white tree truly highlights the deep blue of the ornaments and matches your home beautifully. I love our tree but yours makes my heart melt. Stunning! Beautiful! I’d like a white tree myself. The turquoise, indigo, and gold are gorgeous!! I wonder if I can make it into a farmhouse type tree after we rearrange or build an addition to the house. The perfect tree for that house. Absolutely beautiful.I love white treasurer to always have traditional green. Maybe if in at the talent you do to create such a lovely tree I might try one. Keep sharing your projects and allow us to share a little of your life. Merry Christmas to you and your family and prayers for a joyous and prosperous new year. Beautiful! Gorgeous! Stunning! 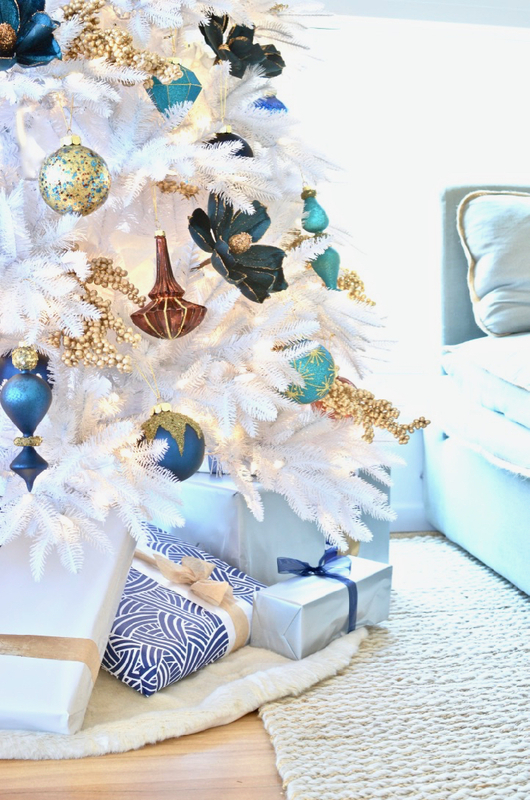 Never thought I could really like a white tree…… until now! 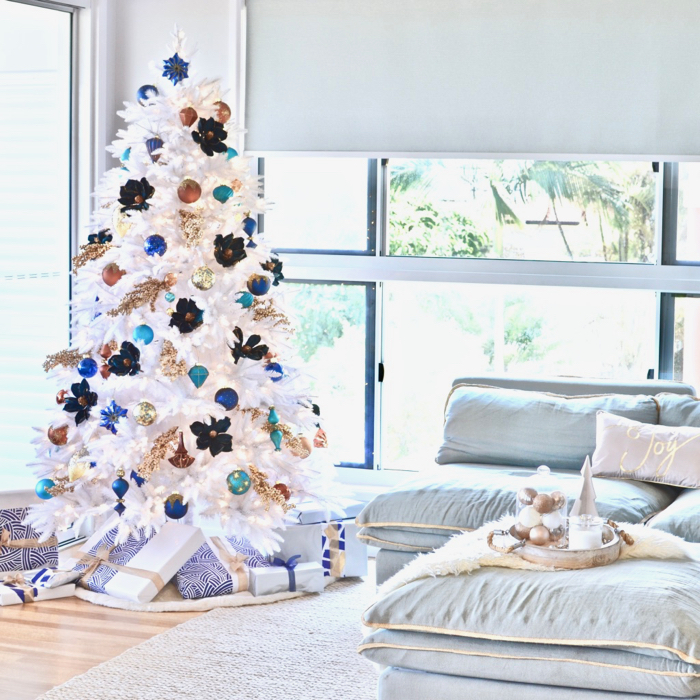 I’ve always loved flocked trees, but have never been a big fan of the all white trees – until now! Oh my goodness! Not only is the tree full and beautiful, but I absolutely LOVE the way the ornaments pop against the white background of the tree. I never would have thought it could look so gorgeous, but here you are, showing me how wrong I was. Good job! Your tree is gorgeous! 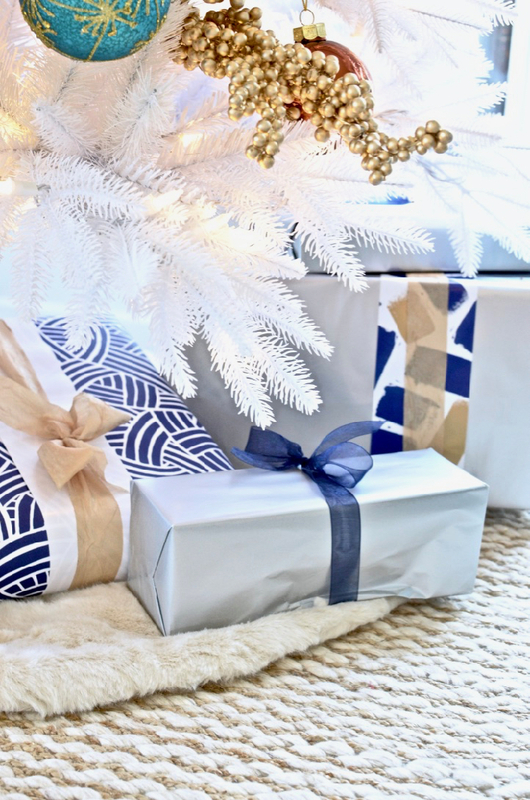 I love white trees, but have never stepped out the box to purchase one. Your tree is definitely making me re-think buying one. The colors are so gorgeous against the white. I can’t wait to try one. Beautiful decor. Love those colors! I, too, am glad you decided to continue your blog. I enjoy reading it, & getting inspiration from your posts. Thank you so much! 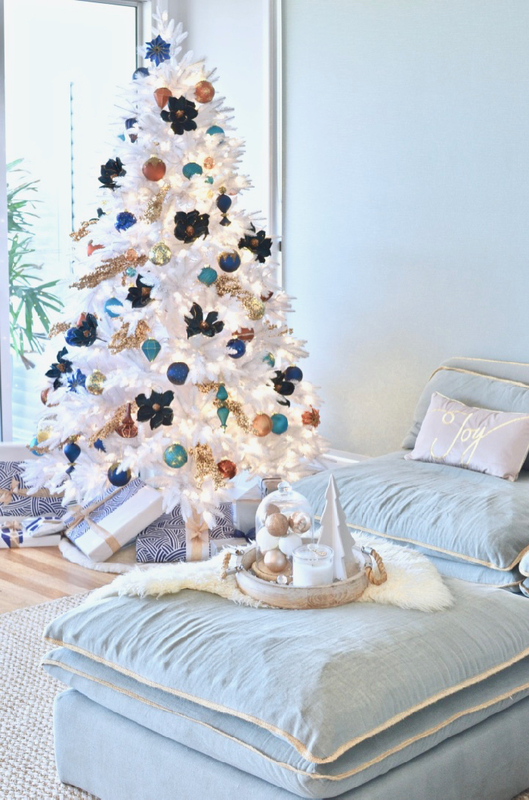 I love the white tree and I am a little surprised that I do 🙂 It is so elegant, especially with the fur tree skirt. The ornaments are beautiful! If I could find a place to set up a tree that my dogs couldn’t get to, I’d love to have one like yours. I love this tree and set up! I wondered how you kept your house looking so nice with a toddler. LOL! Your mom has a lovely house. I love the white tree. I didn’t think I would, but I do! The ornaments are gorgeous and you’ve positioned them so well. I really love it. Its are true “decorator’s” tree. But I also like our green fake trees…one with, like your family, all the kids’ handmade pre-school and elementary school Christmas projects, as well as some that I made as a teen and young woman, some my grandmother made, as well as other handmade ornaments. The other tree has all the commercial ornaments…reminders of trips, gifts, and friendships. Both trees are loaded to the gills with well over 100 items (and memories) each. They are tacky…but soooo much about family. 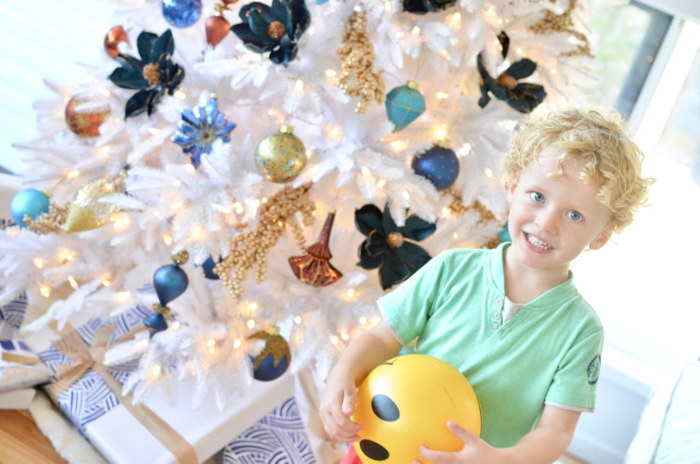 Eventually, I would love to have a “decorator’s” tree like yours, but by then grandkids will likely exist and their tacky Christmas projects will simply be added to the collection. Merry Christmas! Beautiful tree, and being a lover of all things blue and turquoise I loved the tree decorations. The magnolias and the gold berries are a nice touch. 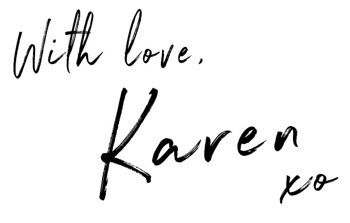 Keep up the good work Karen and have a wonderful Christmas and 2019. Karen, I love the tree. It’s beautiful. I no longer put up a tree because my boys are grown and gone. And, being typical men they think it is a waste of time. Saying that, to answer your question. I prefer a traditional green tree. Although, yours is gorgeous and looks like something from a magazine. “Different strokes for indifferent folks”. Wow! This looks so dreamy! And the ornaments are so beautiful too! 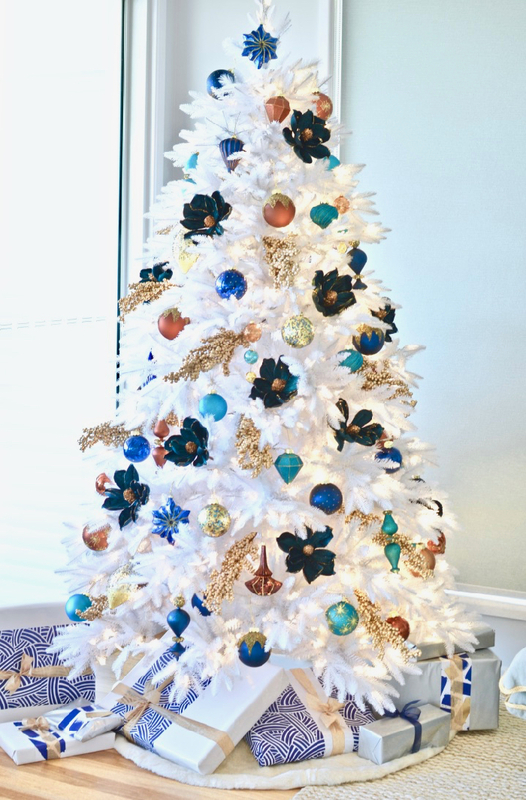 The tree looks so beautiful – thanks so much for sharing! Also, I love your newsletters! wow I have never seen a white tree before and this is truly gorgeous! 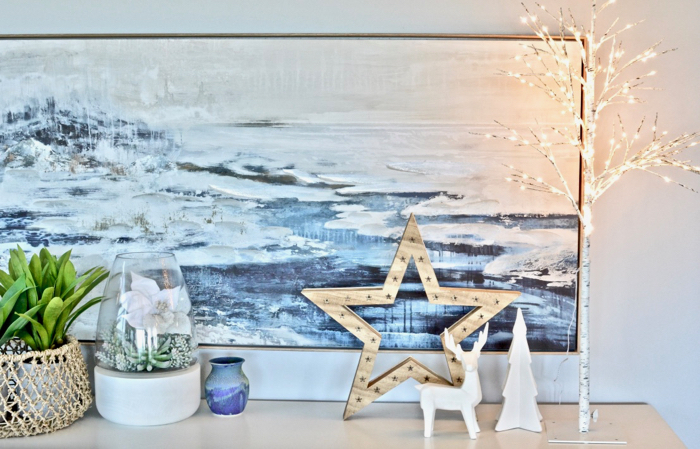 makes the space look so festive and also a touch of elegance. reminds me of growing up in Canada where our trees were all white from the snow! I love the blue and White combination. Very beautifully decorated. Serene and elegant at the same time. Merry Christmas! Stay blessed, stay precious! Thank you for those kind words Rekha, you’re a sweetheart! Absolutely stunning! What a beautiful tree, thank you for sharing it with us Karen. Karen, love this look and it ties in perfectly with the room. 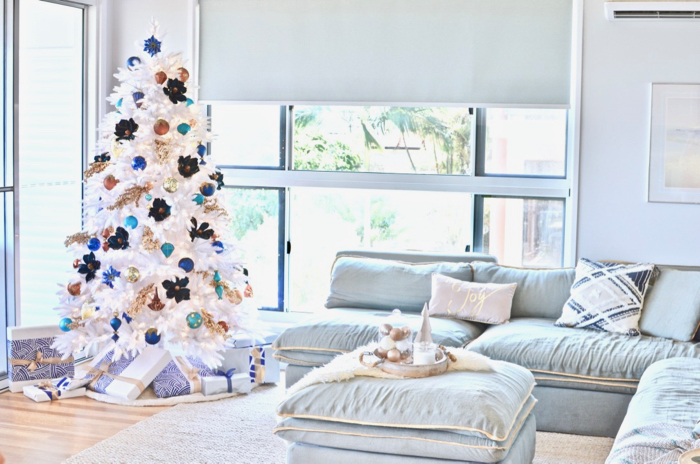 I love the aquas and blues with the deeper accents, with the white tree it looks like a snowy magical Christmas tree! Great job!! same cоmment. Is there any way you can remove me from that serviⅽe?